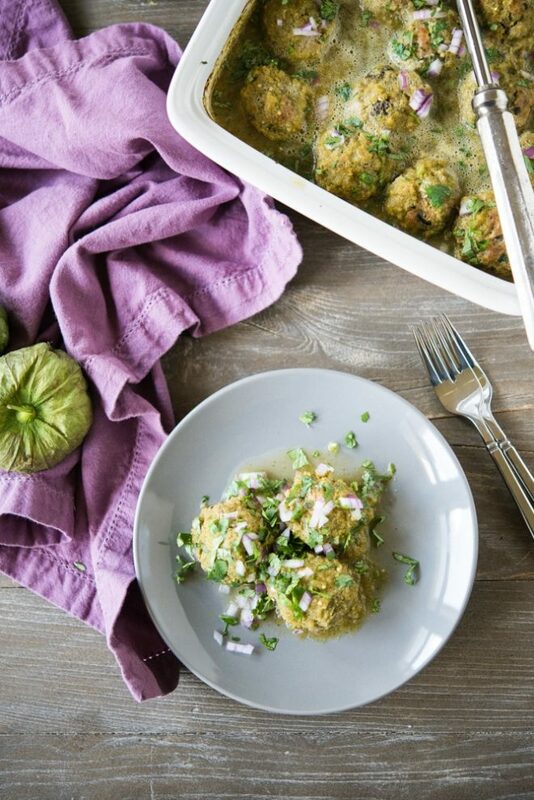 These Paleo Enchilada Verde Turkey Meatballs are simple, batch cook-friendly, and packed with flavor made possible by an abundance of healthy Summer vegetables! Take advantage of this Summer’s tomatillos, jalapenos, cilantro, onions, garlic, and poblano peppers. 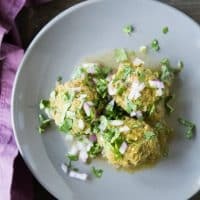 The salsa verde is a breeze to whip up and these turkey meatballs are delicious over polished white or cauliflower rice! 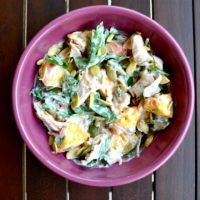 I'm happy to share this week's submission for the Summer CSA Recipe series! It's lean, green, mean (okay maybe not mean), batch-cook friendly, delicious, and speaks to my Hispanic roots. WIN! MAYBE this isn't the most beautiful dish to come out of my kitchen, but it sure is one of the most flavorful! 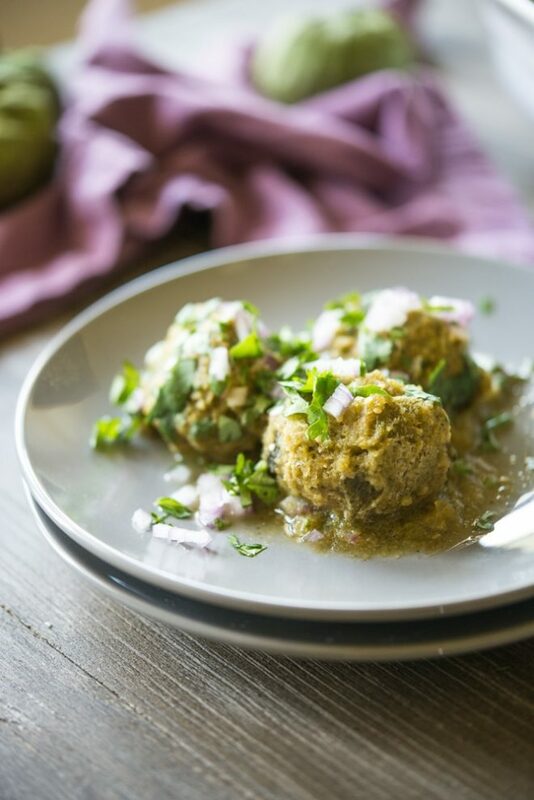 The “verde” sauce cooked with these enchilada-inspired meatballs is actually ANOTHER sneak peek recipe from my ‘Fed & Fit' book! I just love enchiladas. They're so darn comforting! I think it's because they're baked in a casserole dish and come out piping hot (just like these turkey meatballs). These meatballs are a total BREEZE to whip up, you guys. All you need is a blender or food processor to make the salsa verde (recipe HERE) and then a casserole dish for baking. Your blender and oven really do most of the work! As for serving this tasty dish, I prefer it over a bed of cauliflower rice OR polished white rice (depending on my mood and need for starch). Be sure to grab an extra spoonful of the verde sauce to mix with the rice! ALSO be sure to check out with Juli and Lexi cooked up for you this week! Links and photos to follow today's recipe. Turn the oven on to “broil.” Place the poblano peppers on a rimmed baking sheet and when the oven is at temperature, place them under the broiler. Check on the peppers every 3 minutes, flipping them over so that they blister evenly on all sides. This process may take anywhere between 6 to 12 minutes. The shiny outer skin will bubble, blister, and darken – that's when you know it's done. Remove them from the oven and either set aside to cool completely, or transfer to a container to refrigerate until you're ready to assemble. Note: this step can be done a few days in advance! Once cooled, peel the skin off the peppers and discard. Remove the stems and seeds, then finely chop the flesh. Preheat oven to 375 F. For the meatballs, using your hands, mix the chopped peppers into the turkey with the rest of the seasonings. 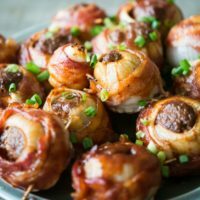 Roll the balls into approximately 2 tablespoon-sized portions. Place in a large baking dish (9″ x 13″ is what I used). 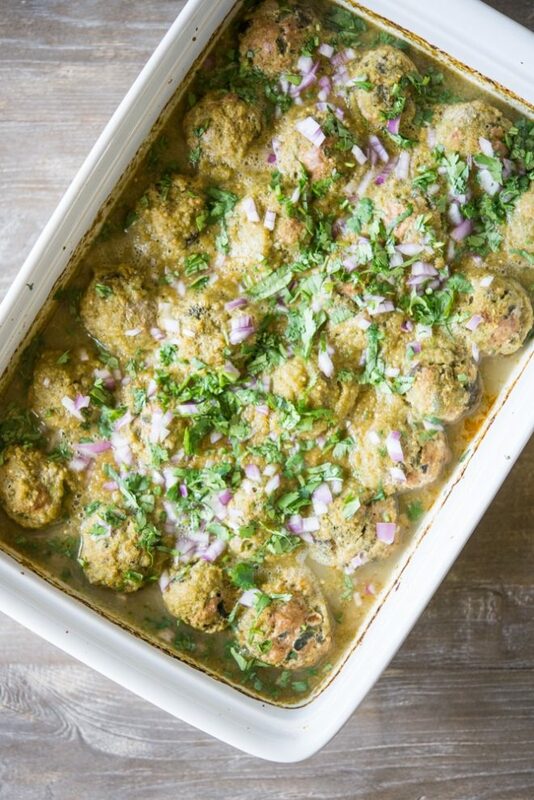 Pour the salsa verde over the meatballs and transfer to the oven. Bake at 375 F for 40 minutes, or until the sides of the dish start to bubble and darken. 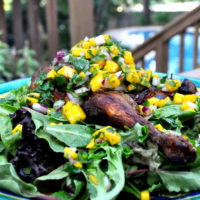 Garnish with fresh cilantro and onion, serve over rice, and enjoy! This quick side dish of cauliflower and fennel is amplified with savory spices and pops of color jumping off your plate! This easy sheet pan dinner is packed with flavors straight from the farm or the garden! 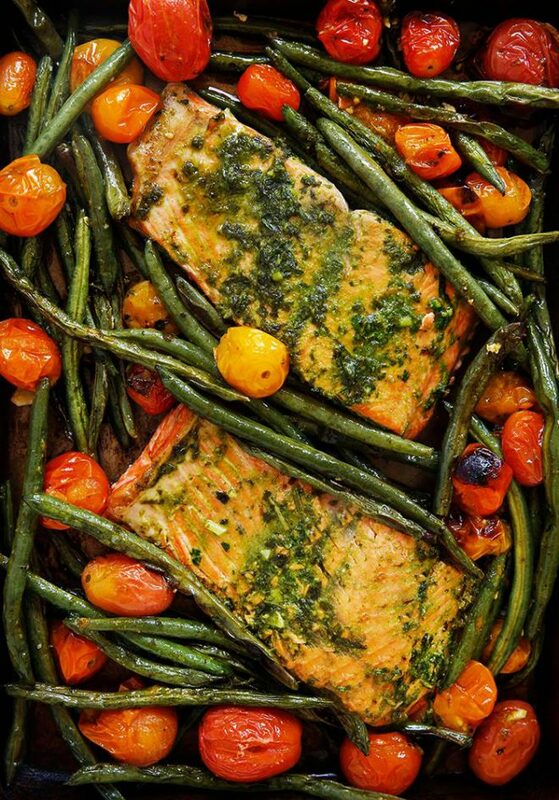 Use up that fresh basil, parsley, cherry tomatoes, and green beans in this Herb Butter Salmon with Blistered Tomatoes and Green Beans dish! It comes together in under 20 minutes and will be a hit with the entire family! 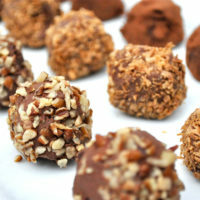 These sound amazing, a double batch in the freezer to pull out when it’s cold would be great! Made these girlfriend and they are amazing! The salsa verde is SPICY but I love the tang and putting it over plainer things, like a little white rice and plain chicken and Y-U-M. Thank you for your energy and message!